And How Can We Get It Back? 7 essential strategies for making yourself, your team & your organization more innovative. 4 culture change actions to navigate the key innovation paradoxes – using the polar positioning technique. Grant, A. & Grant, G. (2012). 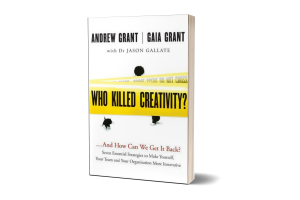 Who Killed Creativity?… And How Can We Get It Back? : Seven essential strategies to make yourself your team and your organization more innovative. Brisbane: Jossey Bass (also published internationally). Grant, G. (2015). ‘Can we meaningfully compare creativity across cultures?’, in Culpepper, M. & Burnett, C., Big questions in creativity (vol 3), ICSC Press, State University of New York, Buffalo. Grant, A. & Grant, G. (2016). 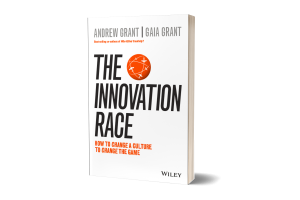 The Innovation Race: How to change a culture to change the game. Brisbane: Wiley. Grant, G., Knight, E. and Cuganesan, S. (2017). ‘Rallying around a shared purpose: How the top management team experiences paradoxical demands in strategizing.’ 33rd European Group for Organizational Studies Colloquium, Denmark July 4, 4th International Process Symposium on Process Organization Studies, Greece June 23. Grant G., & Cuganesan, S. (2018). ‘Dual leadership dynamics: Identifying how dual executive leaders navigate competing innovation sustainability demands in growing organisations’, Academy of Management Specialized Conference (AOM), ‘From Start-up to Scale-up’, Tel Aviv, Israel, 17 December. Grant G. (2018). ‘From detecting dichotomies to navigating dipoles: How senior leaders negotiate competing demands. 34th European Group for Organizational Studies (EGOS) Colloquium, Tallin, Estonia, 7th July. Articles have been published in The Australian, The Sydney Morning Herald, The Age, HR Journal, Daily Telegraph, and The Straits Times, Fast Company, Australian Institute of Management, American Management Association, CEO World, Marketing Magazine, Learning and Development Professionals, Human Capital Online, B&T, First 5000, HRM Online, Nett Magazine, Australian Financial Review, Asian Wall St Journal. Featured on international radio and TV (eg BBC, plus Australian commercial television) and in several international news and business publications (such as the Australian Financial Review, Asian Wall St Journal, The Australian, The Sydney Morning Herald, The Age, HR Journal, Daily Telegraph, the Straits Times etc). Sample media interviews: https://the-innovation-race.com/media/.